Multiplication is an arithmetic operation for finding the product of two numbers. 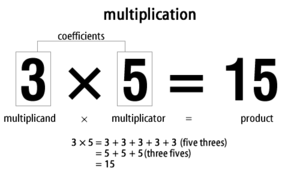 Multiplication is the third operation in maths after addition which is the first, subtraction which is the second and then there is multiplication. With natural numbers, it tells you the number of tiles in a rectangle where one of the two numbers equals the number of tiles on one side and the other number equals the number of tiles on the other side. For example, three multiplied by five is the total of five threes added together, or the total of three fives. This can be written down as 3 × 5 = 15, or spoken as "three times five equals fifteen." Mathematicians call the two numbers you wish to multiply "coefficients" together, or "multiplicand" and "multiplicator" separately. Multiplicand × multiplicator = product. Multiplication between numbers is said to be commutative- when the order of the numbers does not influence the value of the product. This is true for the Integers (whole numbers), e.g. 4 × 6 is the same as 6 × 4, and also for the Rational numbers (fractions), and for all the other Real numbers (representable as a field in the continuous line), and also for Complex numbers (numbers representable as a field in the plane). It is not true for quaternions (numbers representable as a ring in the four-dimensional space), vectors or matrices. The definition of multiplication as repeated addition provides a way to arrive at a set-theoretic interpretation of multiplication of cardinal numbers. A more accurate representation is to think of it as scaling quantities. This animation illustrates 2 being multiplied by 3, giving 6 as a result. Notice that the blue dot in the blue segment of length 3 is placed at position 1, and the blue segment is scaled so that this dot is placed at the end of the red segment, of length 2. For multiplication by any X, the blue dot will always start at 1 and end at X. This works even for X smaller than 1, or negative. The opposite of multiplication is division. Teachers usually require his pupils to memorize the table of the first 9 numbers when teaching multiplication. This page was last changed on 9 August 2014, at 03:23.